Mark Minervini Interview II - Any questions? Around about this time last year I interviewed Mark Minervini, the popular US investor, and the resulting article got quite a lot of interest. At the time, Mark was writing a follow up to his trading book, Trade Like a Stock Market Wizard. 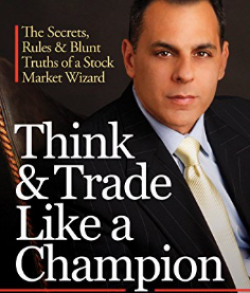 A few months after the interview, he published Think & Trade Like a Champion. We kind of agreed at that point that it would be good to catch up again when the new book was out. So that’s what we’re going to do. I’m doing another interview with Mark in the next couple of weeks, so if you have got any questions you’d like me to ask him, just let me know in the comments below. Last time around, it took quite a lot of time to get the whole thing over the line, so be aware that might happen again. I'd like to ask him if he thinks humility is an important trait for a good trader/investor? For the record, I don't read investment books although The Snowball is a great read, it's not really about investment. Tbh I've never understood why there are so many books on the subject. If I was busy making millions I'm not sure I'd be bothered to let anyone else know my secrets by writing a book, so it's nice to see that others are more charitable with their time. In your previous interview Mark said he was out of the markets from 2000-2004. Is he completely out of all trades during down times or does he still do some trading, in particular shorts? Does Mark view himself as a trader or an investor and what does he think the difference is? How does he view himself versus long-term investors? How much does he turnover the portfolio each year? Does he think his approach can successfully be copied? Does he consider whether a company has an attractive long-term future before making a trade/investment? I concur with the question around the 10% stop loss where the spread is wide - would Mark flex the 10% in this situation. Separately, having read the sections in Trade Like a Stock Market Wizard on risk management, I understand how Mark got himself out without being hurt by the serious market downturns. What I would like to know is how he stops himself getting back into the market too early - what are the key indicators he looks out for to determine that the market is reaching a bottom and should change direction? Mark Minervini has repeatedly said that he doesn't try to time the markets. He just buys shares that correspond to his criteria and sells the ones that don't anymore. In a downturn the opportunities get scarcer naturally so he invests less. For risk management spread (the difference between the ask and the bid) is important. In the UK we seem to have large spreads on some small caps, indicative of a lack of liquidity. Would he rule out shares based on a wide spread and what is his rule of thumb for this? I’m not sure about that, he has been very bearish recently and has shorting the market, surely that about timing the market? As a huge Minervini fan, how have I not seen this post until now? By the number of comments it's clear to see that he's got a big following here! If questions are still open I'd like to ask: Is revenue concentration risk a factor when considering a stock? i.e one customer accounting for a majority of the revenue. If so, what's the revenue percentage he would consider too much? Hi HumourMe - we did cover this actually. The interview is done so it should be cleared to publish soon. @Mike888 - I do record interviews, but not really at decent enough quality to upload. I'm thinking about how I could change that. @ricky65 - I've done the interview now. We didn't cover that specifically, but we did cover a lot of ground, which should help. Ben - Just to let you know - Snowball is a great microphone - About $100 - Much improves even Skype conversations if nothing else. No problem, looking forward to the interview! Look forward to seeing the interview Ben. Shame I didn't get my question in! It would be interesting to know if his momentum technique works in volatile markets (as we are seeing at the moment) and what adjustments he makes to his system to maintain its effectiveness. I'm finding it more difficult to set stops an appropriate distance without them being triggered due to the extra volatility which impacts risk / reward ratio somewhat ! He has been mostly or all cash recently, he has been shorting the market with Boost Nasdaq 100 3X Sht Day ETC (LON:QQQS) although I think he has been stopped out. For more info. see his twitter feed. One disappointment is his latest book is not available in UK apart from the kindle version. "Most of my longs have held above their stops - I continue to hold names such as $QDEL, $BURL, $URBN, $FIVE, $FND, $SFLY (sold 75% of my position higher at a profit). Breakouts from our buy alert list today were $AAXN, $PJT and $ANF "
I didn't see him mention that he still has QQQ recently. It is relatively easy to order from amazon.com ... especially when compared to trekking to a bookstore! I was talking more about the last 3 months or so. Not sure if he has the short on at the moment but he has said "There's a very high likelihood that the Dow undercuts 23,860 and a good chance it test or undercuts the absolute low of 23,360." Yes he has a few shares still, "I still have a handful of names long (they are well above their stops), but my overall exposure is quite cautious." On Feb 8th "I am in 100% cash; closed my Dow short on Monday near the lows." So he has been in and out of the market this year. Postage is high, it's over $44. Bookshop is just down the road. Why is it not available on Amazon uk, his other books are. I got mine for $30 including P&P. No idea why not available in the UK and got tired of waiting.